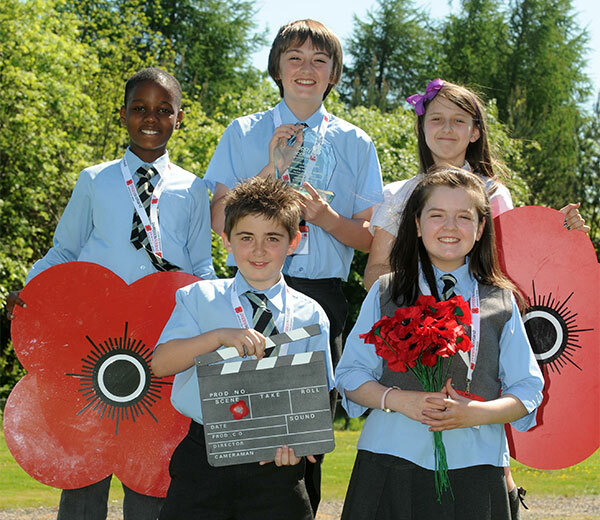 Last year, Poppyscotland launched a new film making competition with schools called ‘Moving Stories’. The competition invited primary and secondary schools to create a script, storyboard or completed short film that represented their thoughts on the theme ‘90 years of the Poppy – then and now, 1921 – 2011’. Four schools were shortlisted and given the opportunity to work with a professional filmmaker for a day in order to remake their film. The final films were then posted on our website to be put to the public vote to decide the overall winner. Now, after a month of intense voting, the final stage of 2011’s moving stories competition has concluded. The votes have been counted and verified and we are very pleased to announce the winner of the competition. James Stokes – A Gorbals Hero. Knightswood Primary School – Ninety Years of the Poppy – Then and Now. This year’s competition has been a great success and we would like to thank everybody that took part. The effort and enthusiasm displayed by all the participants has been great and we hope that next year will be as much of a success as this one. The Winner - St Brigid's Primary School - James Stokes - A Gorbals Hero. This documentary film takes the incredible exploits of James Stokes – a little known Victoria Cross winner from the Gorbals in Glasgow – as the starting point for a thought provoking and moving discussion on the nature of heroism by the pupils of St Brigid’s, and a highly decorated Second World War veteran from Glasgow. All Saints Secondary School - For Our Tomorrow. Robbie is a normal young man living in Glasgow, but his Gran is worried that he may be making the wrong choices in his life. After Robbie and his pals confront a Poppy seller, his Gran and sister unwittingly bring about a change in Robbie’s outlook. This short drama features great performances and a powerful message. Knightswood Primary School - 90 Years of the Poppy. This charming short film uses period reconstruction, a thoughtful voice over, and poetry to perfectly encapsulate more than ninety years of the Poppy Appeal in Scotland. Dunoon Grammar School - A Portrait of Walter. Some wonderful research by the filmmakers reveals that an old boy of Dunoon Grammar School – Walter Smith – took part in the famous truce and football games on Christmas day in 1914. This film tells the story of Walter and his three brothers whilst also managing to make this compelling event resonant for modern times.